Should I Build or Should I Destroy? This (scroll down for the lyrics) was one of the many hits of this year’s roboARTS summer camp! All of the stories, songs and robots were completely imagined and written/constructed by the kids. And they were all AMAZING!!! They featured such dynamic characters like the captain goldfish robot searching for his great grandfather’s lost treasure, Sandy the sand witch and her crusade to become a respected comedian, disobedient robotic dogs in a dog show gone terribly wrong, a robotic drumming deer, a robotic tacos, space bugs wandering the galaxy and much much more. Check out the final performance below. roboARTS is a unique, marriage between robotics and the performing arts created through a partnership between the Paramount Academy for the Arts and Science in a Suitcase. 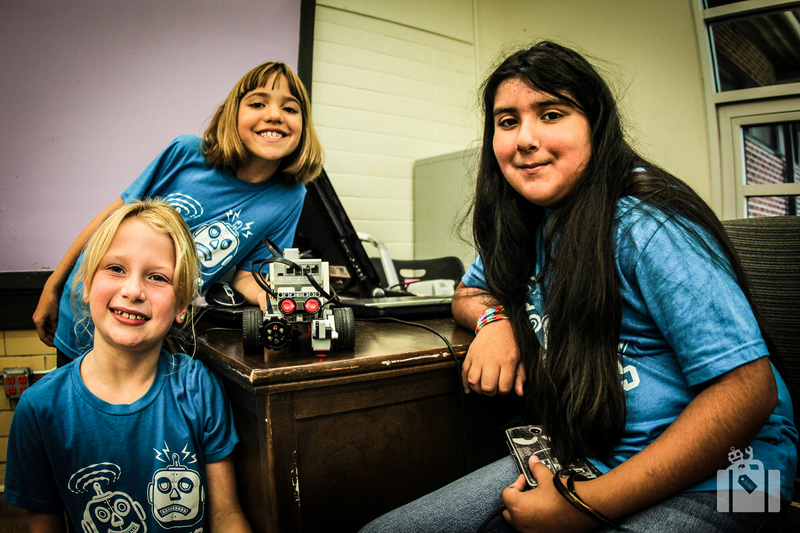 It brings together students who are interested in building and programming robots with those passionate about creative writing, music, and performance. The goal of the program is to have robots and students performing side by side, with material written and created by the students themselves. Original scripts, songs, and scenes are performed and robots are designed, built, and costumed for the sharing. We are excited to announce that roboARTS has expanded to two after school programs for the school year. One is at Ann Richards School for Young Women Leaders and the other is at Kealing Middle School. We can’t wait to see what these kids create! “CHORUS: Should I Build or Should I Destroy? Should I Build or Should I Destroy? Derek: It’s a killer robot!… but we built it. Caleb: It wasn’t always this way. Layn: Our robot used to play tag, eat tacos, and do homework with kids. River: That’s why we invented it. Kevin: But the kids started to wear it down. Kailly: It began to feel used, and its dissembled mind began to resent the humans. Joseph: We asked it to build us a great city. Derek: What’s happening? Its decision has been made?! Caleb: Its confusion sets it in a race! Layn: It hacks the Factory of a Better Tomorrow at a fast pace! River: Flashing Lights! Alarms go off! Kevin: Panic storms through the buildings! Kailly: There’s nothing we can do!